TALLAHASSEE, FL – Florida-based U.S. 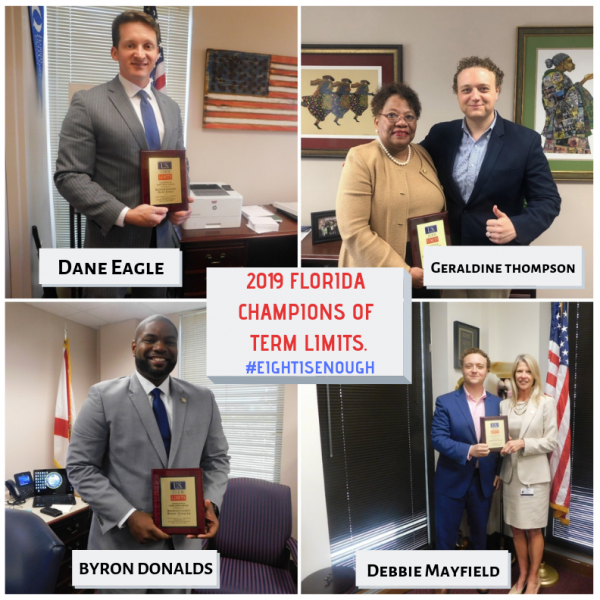 Term Limits, the nation’s largest pro-term limits group, today announced it was honoring 25 state legislators as 2019 “Champions of Term Limits” in Florida. Florida has 8-year term limits on its governor, cabinet, state legislature and countless local positions. There’s also an effort underway right now to let voters enact a constitutional amendment for 8-year term limits on all district school boards. Polls show that between 75 and 85 percent of Americans favor term limits for public officials, with a strong preference for 8-year limits. Receiving the “Champion” honor and plaque in 2019 are state representatives Mel Ponder (HD 4), Cord Byrd (HD 11), Jason Fischer (HD 16), David Smith (HD 28), Anthony Sabatini (HD 32), Geraldine Thompson (HD 44), Anna Eskamani (HD 47), Rene Plasencia (HD 50), Tyler Sirois (HD 51), Randy Fine (HD 53), Cary Pigman (HD 55), Melony Bell (HD 56), Dane Eagle (HD 77), Spencer Roach (HD 79), Byron Donalds (HD 80), Toby Overdorf (HD 83), Rick Roth (HD 85), Mike Caruso (HD 89), Chip LaMarca (HD 93) and Bob Rommel (HD 106). On the State Senate side, senators Aaron Bean (SD 4), Dennis Baxley (SD 12), Ed Hooper (SD 16), Debbie Mayfield (SD 17) and Ben Albritton (SD 26) were honored. All the honorees have signed pledges vowing to protect 8-year term limits in Florida from lobbyist-led efforts to lengthen or repeal them. Some, like Senator Aaron Bean and Representative Geraldine Thompson, previously played key roles in helping Florida become the first state in the nation to call for congressional term limits in 2016*. Tomboulides hailed the bipartisan group for supporting term limits. “It takes guts to stand up to the special interests that prefer Florida had no term limits. We applaud these members for listening to the people,” he said. View photographs of recipient awards here. * The initial publication of this release indicated that Florida passed its term limits proposal convention application in 2015. It was, in fact, passed early 2016. U.S. Term Limits is the largest grassroots term limits advocacy group in the country. We connect term limits supporters with their legislators and work to pass term limits at all levels of elected officials, particularly on the U.S. Congress. Find out more at termlimits.org.